Kiev (AFP) - The OSCE said it was "very concerned" after its monitors witnessed columns of tanks, howitizers and troop carriers moving through east Ukraine in territory held by pro-Russia separatists. 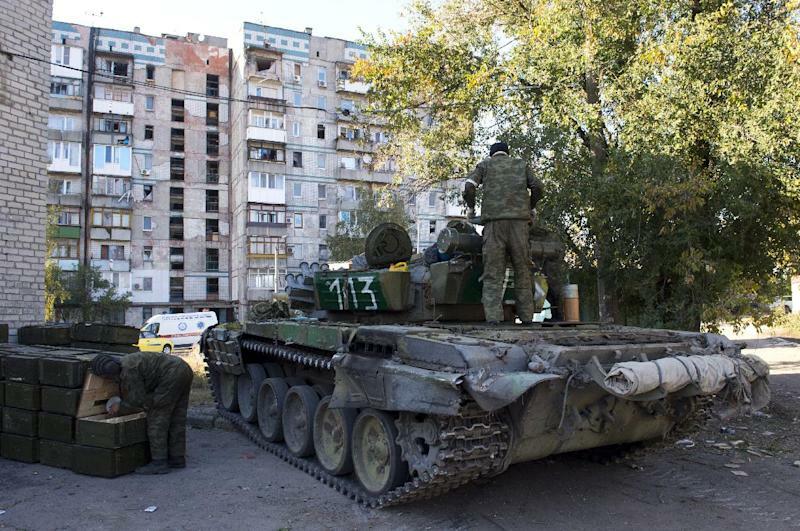 Monitors from the European security organisation said in a statement late Saturday they had "observed convoys of heavy weapons and tanks" in the area of the rebel-held city of Donetsk and nearby Makiivka. The OSCE report came a day after Ukraine's military said it had spotted a large column of tanks and other heavy weapons entering the country from Russia across a section of border that has fallen under control of rebel fighters. Russia denies being involved in the fighting, although it openly gives the rebels political and humanitarian backing. "More than 40 trucks and tankers" were seen driving on a highway on the eastern outskirts of Makiivka, the OSCE representatives, who are monitoring a barely observed ceasefire signed in September, said. "Of these, 19 were large trucks –- Kamaz type, covered, and without markings or number plates –- each towing a 122mm howitzer and containing personnel in dark green uniforms without insignia. Fifteen were Kraz troop carriers," the report said. There were also six fuel tankers and an armoured personnel carrier. Separately, the OSCE monitors said they had seen "a convoy of nine tanks –- four T72 and five T64 -– moving west, also unmarked," just south-west of Donetsk. The OSCE said all the forces were on territory controlled by the self-declared Donetsk People's Republic, which is fighting Ukrainian troops in a war that has already killed at least 4,000 people, according to UN figures. The Swiss foreign minister and OSCE chairperson-in-office, Didier Burkhalter, said he was "very concerned about a resurgence of violence in the eastern regions of Ukraine." "He urged all sides to act responsibly and to do all in their power to further consolidate the ceasefire," the OSCE said in a statement. Despite the nominal ceasefire, there is daily shelling across the separatist zone and a steady loss of life among soldiers and civilians.